I love the bright yellow color the turmeric gives. 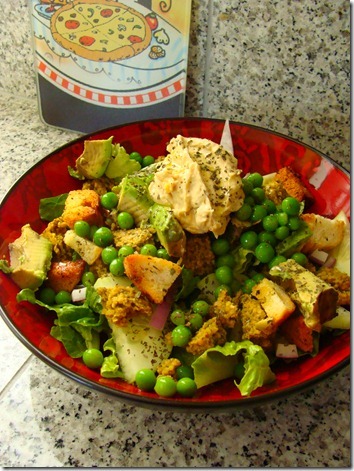 Peas, romaine, cucumber, red onion, home made croutons, 2 falafel patties crumbled, hummus, avocado, dried basil and EVOO. 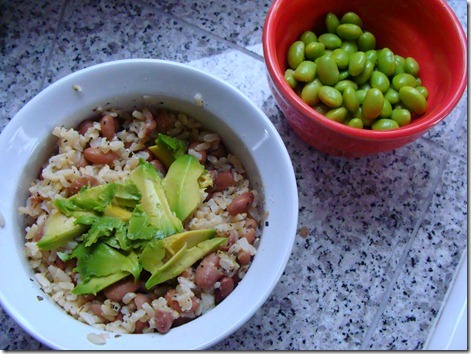 Beans, rice and a side of edamame. I seasoned the rice with salt, pepper, garlic powder and dried basil. 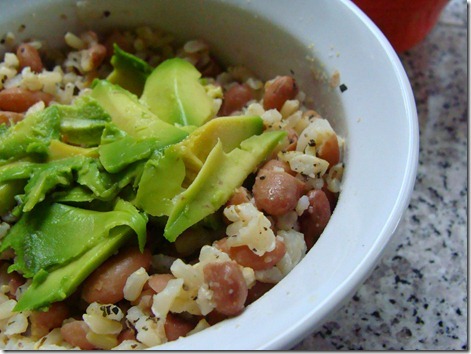 Then topped it with creamy avocado. 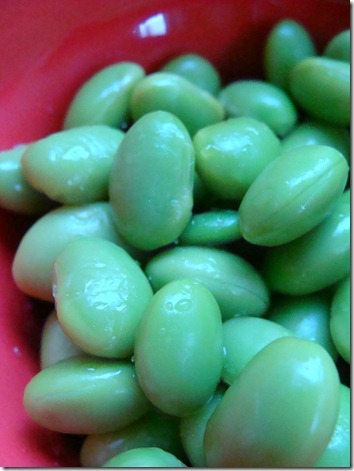 Fresh edamame with a small pinch of sea salt. Over the next week I am planning on answering some questions by my readers. I am very late on some of these so I apologize in advance! =( I have about a dozen emails starred in my inbox… no joke. First off I just want to say how much I love your blog!! Your story is one that I can really relate to – struggling with feelings about food/eating disorders/trying to go veg, etc…..
Today I am a clean eater that wants to take the step to eliminate meat/poultry/fish etc from my diet. It is this nagging feeling I have had since I was a child and really want to make that final step to being truly health aware. I have 2 little boys – My oldest is 4 and he has never eaten any meat ever. A natural vegetarian I have been told. Interesting. That and picky! 🙂 My little one is 17 months next week. I want them to have healthy and strong body and minds. Can you help me by giving me a very very basic run down of your daily menu template of sorts? I am not sure how to describe it but I will tell you my current "template" and maybe you could help by sharing your version. Currently I eat cold or hot cereal for breakfast (some times adding fruit and/or nuts) and with skim milk. I eat a mid morning snack that is usually a bit more carbs like a small whole grain bagel with nut butter or something similar. Fruit on the side. Mid afternoon snack is often veggies and hummus or another salad or yogurt and granola and fruit. Dinner is always a meat protein with tons of veggies (sometimes in an ezekiel wrap). Thanks, Tammy! What a great question. I know how difficult making meals that are both interesting and great tasting can be. 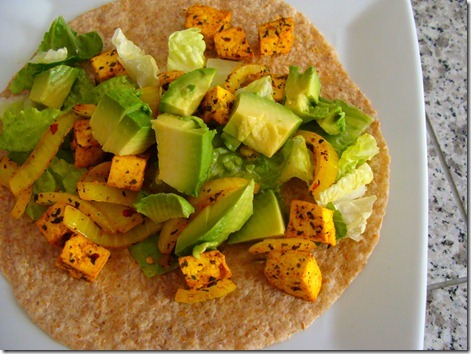 You are on a great track and I fully understand you wanting to eliminate meat from your everyday diet. I started eliminating meat one meal at a time. Having a meat-eating husband I found myself face-to-plate with meat quite often. Since I am a stay at home mom, I eventually eliminated meat from breakfast, then lunch, and then I popped the big statement one night: “I want to be a vegetarian.” At first I don’t think he believed me and still offered me meat at home and when we ate out. My family didn’t quite understand, either. Saying, “Just this once – it wont matter!” I never gave in and it is getting easier and easier. But I will admit I was a little lost with what I was going to eat. Having relied on meat so much in the past it was mind boggling to NOT eat it any longer. Luckily the plethora of wonderful food bloggers helped me see past the meat. Whether I was randomly clicking blog rolls and looking for “vegetarian” tags or Google searching, inspiration was all around me! Tammy, you are on a perfect path! In fact, you really don’t need to change much at all. It’s easy to substitute meat for beans, tofu, seitan or meatless-meat products. And I have said it before, right now is the best time to be vegetarian! There are so many great products out there! However, if you are still wanting to eat clean, like I do, be very careful about the meat-less products. There are some pretty weird ingredients in them. I buy faux sausage and “chicken” nuggets for J but I pass on the stuff for me. 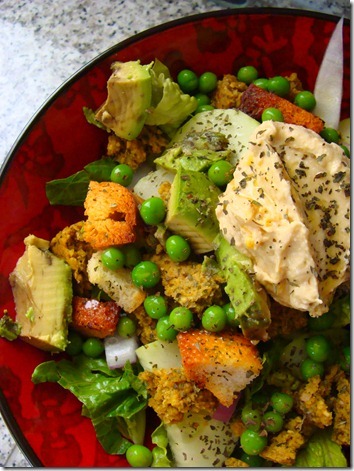 For your lunch salad, swap beans for your chicken – I love garbanzo, black or pinto beans. 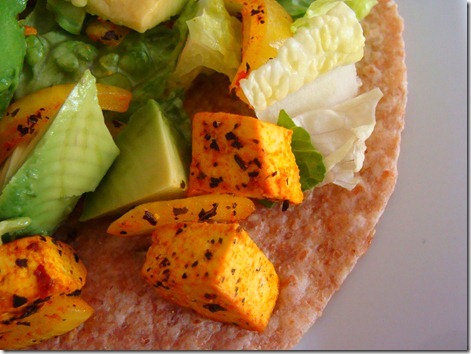 For wraps I always use A LOT of hummus and fresh veggies – YUM! To sub a piece of meat at dinner may seem a bit challenging. I love making a pot of hearty vegetarian chili, a spinach meat-less lasagna or making something simple like beans, rice and greens. Remember to keep the ingredients fresh and hearty. If pasta sauce seems boring with meat, add olives, fresh basil, onion and red bell pepper to add texture, taste and color. Last but not least – start slow! if you go full force you may feel over whelmed and become frustrated. Well Tammy I really hope this helps your quest for become vegetarian! If you have any other questions, please do not hesitate to to ask! This entry was posted in breakfast, dinner, faq, lunch, vegetarian. Bookmark the permalink.